Pele, the primal force of volcanic heat and lava, leaves her ancient home of Kahiki and searches out a new home for herself and her family. As she travels down the Hawaiian island chain, she is pursued by, and battles her eldest sister Nāmaka, the goddess of water and the sea. After a climactic battle on the island of Maui, she finally finds refuge in Kilauea on the Big Island of Hawai‘i. E Ho‘omau! (To preserve; to learn from the past and perpetuate the good) is a curriculum development project funded under the Native Hawaiian Education Program of the U.S. Department of Education. 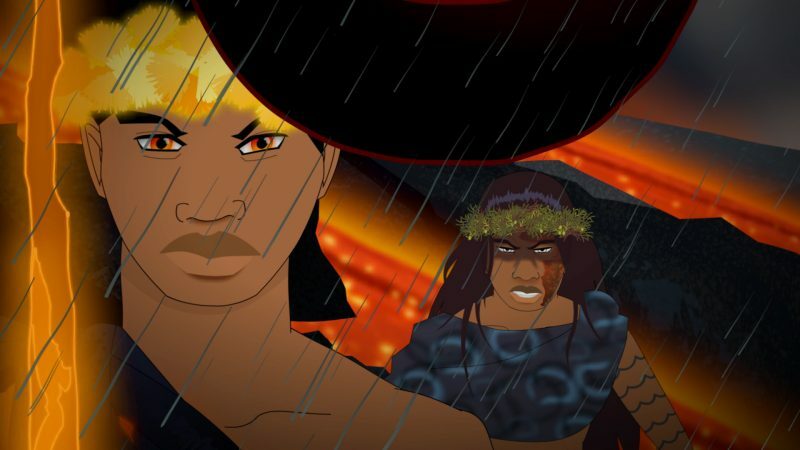 It begins with the creation of three high quality animated versions of traditional Hawaiian legends, designed to be engaging and culturally appropriate. These are complemented by standards-based written materials and teacher training activities to strengthen language arts and science achievement for Native Hawaiian 4th graders. E Ho‘omau! addresses the need to improve the literacy skills of students of Hawaiian ancestry by integrating evidence-based educational approaches with a visually-rich learning system based on Hawaiian legends. The idea is to elevate student motivation and enhance self-confidence while providing meaningful learning opportunities. For more Pacific Resources for Education and Learning (PREL) products click here. Vimeo is asking to login to view the video. Sorry about that Neil. A privacy setting was incorrect on the Vimeo side. Thanks for the heads up. Mahalo NUNUI ‘oiwiTV!!!! for all of your works!!! to all staff and or contributors in every dept. in everyway, MAHALO!!!!! Aloha, o au ‘o La’akea aia au ma ka papa 2/3 a hele ana au i ka papa 4 I Keia makahiki ‘e a’e. A ‘evalu o’u makahiki a’eiwa ana o’u makahiki maJune 15 . A ai mahalo ia ‘ Oiwi TV no ka hana nui i na wikio a he nui. A maika’i keia ua le’ale’a na wikio a pau. A makemake au ia ‘oukou e hana I na wikio ‘e a’e a mahalo ho’okahi manawa hou ia ‘oe e ‘Oiwi TV. Can to tell me how to find the version with English subtitles? I know previous times I’ve watched it, the video already had them.